Ammonia Levels. Ammonia smell in urine means possible health dangers, especially to rabbits. But here's a way to reduce or eliminate ammonia fumes and levels naturally, safely, easily. Why is Ammonia Odor a Problem? Ammonia is created from bacterial action on a rabbit's urine. The rabbit excretes excess nitrogen if its feed is rich with protein. Bacteria then convert the nitrogen to ammonia, which serves to feed the bacteria. If your rabbitry smells of ammonia, perhaps the percentage of protein in the feed is a bit too high. 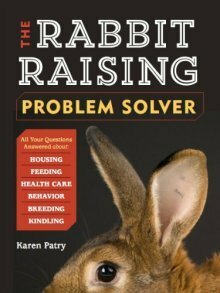 Or, in pet rabbits, it may be time to change the rabbit's litter. Ammonia fumes have long been implicated in lung inflammation, which opens the door to bacterial infection by Pasteurella multocida. In one study, there were no clinically significant effects at 57 ppm, however at 672 ppm, rabbits exhibited redness, discharge and corneal cloudiness. Additionally, every animal in the study, including rabbits, had either areas of lung inflammation or overall diffuse inflammation throughout the lungs as a direct result of excessive ammonia in the nearby environment. Every-day exposure to discernible ammonia levels may also reduce the movement of the cilia lining the airways (tiny waving hairs that disinfect the lungs by brushing secretions and debris toward the mouth). If the cilia slow down, the rabbit’s lungs can’t adequately clean themselves, and without disinfecting from cleaning, it becomes easier for the rabbit or other animal to acquire infections or pneumonia. Ammonia can accumulate in enclosed spaces, such as a bedroom, den, kitchen, garage or barn, if the space is not adequately ventilated. Droppings and urine ‘ferment.’ Ammonia keeps on forming, and the fumes have nowhere to go. Ammonia levels can quickly rise, until the animal begins to really suffer. The problems didn’t stop with the lungs. Renal tubular calcification, bronchial epithelial calcification, renal tubular epithelial cell proliferation, myocardial fibrosis, and fatty changes in the liver occurred in several test subjects, both dogs and rabbits. In a few control animals, similar problems were noted, however in the ammonia group, these conditions were marked, when they occurred. Health damage from ammonia levels spans the gamut of animals, including humans. Ammonia smell in animal urine and wastes can be dangerous to your animals, so any easy method of knocking down ammonia levels is an advantage. With Spalding Labs’ Bye Bye Odor, it could be really easy - just ‘spritz spritz.’ Voila, no ammonia odor. "If it pees and poops, Bye Bye Odor will eliminate the smell," states Spalding Labs. "Bye Bye Odor is a safe and natural solution, especially formulated to substantially reduce or eliminate a wide range of odors associated with animal urine and manure." Bye Bye Odor utilizes microbes that consume and break down the urea and other ammonia-odor-producing substances in animal waste products. This results in minimizing ammonia levels. It doesn't just mask the problem, it eliminates it. No urea -- no odor, and no ammonia! The microbes digest the urea and the other protein wastes before it turns into ammonia, so there is nothing left to smell. And the good thing is - Spalding Labs puts a dense concentration of these safe and natural microbes in their formula, so the job gets done efficiently. A tool such as Bye Bye Odor that actually destroys the substances causing high ammonia levels is an essential one - a powerful way to protect the health of your rabbits, to prevent losses from snuffles and other lung or kidney diseases, and to protect your own health as you care for and enjoy your rabbits. Bye Bye Odor is safe for both people and animals. Microbes such as those used in Bye Bye Odor have been used for decades for breaking down odors from many sources. It probably won’t stain or discolor anything, but always test it on an inconspicuous area first. Clean rabbit spaces as usual. Three to five days of daily application will result in a huge reduction of unpleasant smells. It even works for tomcats that ‘mark’ around the house. Once the Bye Bye Odor has been opened, it must be used within 60 days. "Bye-Bye Odor is absolutely amazing for cloth diapers! Someone posted in a Mom forum with information on a product you carry, recommending it for use on cloth diapers. (You know how they start reeking after sitting in that pail for a while.) I tried it on my baby's diapers that were having ammonia build up and I swear by it now!" "I love this stuff! I mix it in a spray bottle with water, as per the directions, and use it to spray my cat’s litter box each time I clean it out. It immediately eliminates the odors, and I’m finding I can go for longer periods without having to completely change all the litter. Also, I used to use ‘regular’ cat litter like Tidy Cats because ‘natural’ cat litters didn’t control the odor enough, but I hated exposing my cat to the chemicals they put in those litters. Since buying Bye Bye Odor I’ve switched to the Worlds Best Cat Litter (made of corn) and it’s the perfect combo! Safe, chemical free litter and no unpleasant odors. I bet this stuff also works wonders on ‘wet spots’ in horse’s stalls, though I haven’t tried it for that yet. I have a friend who uses it on her bunny cage with great results as well." "I have been using this product for 7 months now and it does what it says! I have a 5 stall barn with a mare in foal, a senior with a very large bladder, and a horse that walks round and round in the stall mixing everything in very well. But, this product works exactly as advertised every time I use it. Initially I was using a lot, soaking the really heavy pee spots. When I ordered from Spalding again so soon, he questioned why I was going through so much. He said, ‘Only mist it, don’t douse it.’ He was right. I got a 2 ½ gallon sprayer from Lowes and mixed the Bye Bye Odor with water and the odor is GONE!"